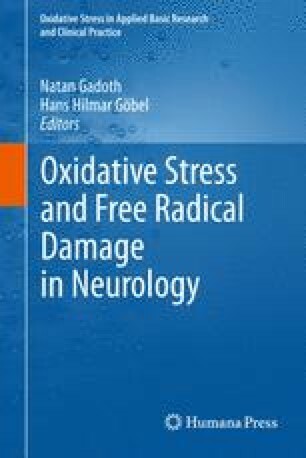 Why Is the Nervous System Vulnerable to Oxidative Stress? The nervous system is especially vulnerable to reactive oxygen species (ROS)-mediated injury for the following reasons. (1) High oxygen consumption of the brain for high energy needs, that is, high O2 consumption, results in excessive ROS produced. (2) Neuronal membranes are rich in polyunsaturated fatty acids (PUFA), which are particularly vulnerable to free radical attack. (3) The ratio of membrane surface area to cytoplasmic volume is high. (4) Specialized neuronal conduction and synaptic transmission activity depend on efficient membrane function. (5) Extended axonal morphology is prone to peripheral injury. (6) Neuronal anatomic network is vulnerable to disruptions. (7) The excitotoxic glutamate is the major effector that causes oxidative stress (OS). (8) The high Ca2+ traffic across neuronal membranes and interference of ion transport increase intracellular Ca2+, often leading to OS. (9) Auto-oxidation of neurotransmitters can generate O2 and quinones that reduce glutathione. (10) Iron is formed throughout the brain, and brain damage readily releases iron ions capable of catalyzing free radical reactions. (11) Antioxidant defense mechanisms are modest, in particular, low levels of catalase, glutathione peroxidase, and vitamin E. (12) ROS directly downregulate proteins of tight junctions and indirectly activate matrix metalloproteinases (MMP) that contribute to open the blood–brain barrier (BBB). (13) Activated microglia produce ROS and cytokines in a perpetual process. (14) Cytochrome P450 produces ROS. (15) Loss of trophic support can activate NADPH oxidase, which increases ROS. (16) The presence of hemoglobin within the neural tissues secondary to spontaneous, iatrogenic, or traumatic causes is neurotoxic. Heme and iron are released and promote ROS. (17) Neuronal mitochondria generate O2. (18) The interaction of NO with superoxide can be implicated also in neuronal degeneration. (19) Neuronal cells are nonreplicating and thus are sensitive to ROS. In comparison with other organs, the neuronal network may be especially vulnerable to ROS-mediated injury because of the following anatomic, physiological, and biochemical properties of the brain.